As I was born (1955) and raised in SC and began going to PSU games when I was about 10 yrs old, you have provided a window into my past and triggered some great memories with your photos. Thank you, Tom. It makes me happy that these long buried photos are providing enjoyment! Very nice photos, great memories. I was a high school senior in NJ in ’64 ‘ and just growing in to my PSU fan-hood. It was forever cemented in 1970 when i moved to Huntingdon, Pa. to teach at Juniate College. My first house was 30 mins door to door to the stadium. Definitely not as intimidating of a place to play as it is today, but great shots! I forwarded these pics to my parents. Both class of 63. I am sure they will get a kick out of them. My dad and I had a laugh awhile back when he told me that he ate breakfast every day at the Diner. The owner would always run him a tab when he had no money. “Ah those were the good days.” I then told him that I too was a frequent patron of the Ye Olde College Diner in the early 90’s. He then told me that he went to the New College Diner. Hello Geezerhood! Thanks, Goose. I’ll look around to see if I have any more photos, but if I have them they would be buried under several layers of sedimentary rock! Glad you enjoyed them! I used to hang out at the NCD after hours back then. I wouldn’t have run into your dad, though, because I got there the year after he graduated. Great photos. I often miss the days before the Jumbotrons, piped-in noise, and luxury boxes. Of course it’s a lot easier now to make it to a bathroom during a game than when I started coming to Beaver Stadium 20 years ago…..
Ahhhh, yes…forgot all about those men’s room lines in the 60s. As I recall, rather than wait in line after the game, I used to water the grass in one of the fields on the way back to the dorm. Great pictures. I was there in ’63 and after the Army to graduate in ’78. I remember being one of the colored blocks. I was wondering if you had any old pictures of Nittany Halls.? That’s where I stayed and they are now long gone. Thanks for sharing what you do have. I did take pictures of the Nittany Halls, but it was on a volunteer assignment for The Penn Statesman and Lord only knows where they might be. I don’t even have a copy of The Penn Statesman with my pictures in it! Bob, you sure have me beat for memories of PSU history. 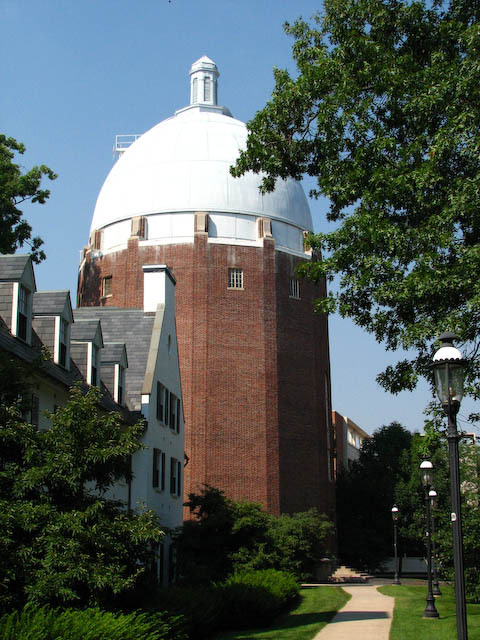 I don’t have any pictures of the old Beaver Stadium, but I do have a picture of the water tower. I hope it enhances some of your pleasant memories! Bob, I found a picture at the PSU Alumni Association Chicago Chapter web site. There’s a little history there, too. In the picture, you can clearly see the water tower. If anyone else can find some good pictures of the old stadium, please post the links here. Thanks for the info. By the way, my brother Bill owned and operated the Mt Mittany Inn on RT 144 obove Center Hall from 1975 to 1990 when he sold it. It has burned down twice since then and I do not know whether it hasd been rebuilt. I was in the Block S in 1964. As a freshman, Blcik S enabled one to get much better seats. This must have been band day. Seeing the photo brought it back to me. It’s almost scary – a captured slice of time. A little smaller then I remembered, but then, I was a freshman. Graduated in ’68. The world had already started to change. It was indeed Band Day. I remember it well. It was after my freshman year that I discovered the work-free way of getting good seats. Find a senior who is away on weekends and use his athletic pass with my matric card in back of his, so it shows his name on the front and my picture on the back. (The ticket guys never looked closely enough to see the numbers on the mug shot or I would have been busted.) After the Pitt game in 64 in which I was frozen to my freshman seat with the 20-degree wind blowing up my legs, I really needed to get out of there. I think I will add the keyword “nostalgia” to all those posts to make it easier to find them using the search box. Hmmm… please use the links I posted instead of searching for the keyword “nostalgia”. I added it to all those posts, but Search doesn’t seem to want to find them.